I am a visual learner. A picture is worth a thousand words. 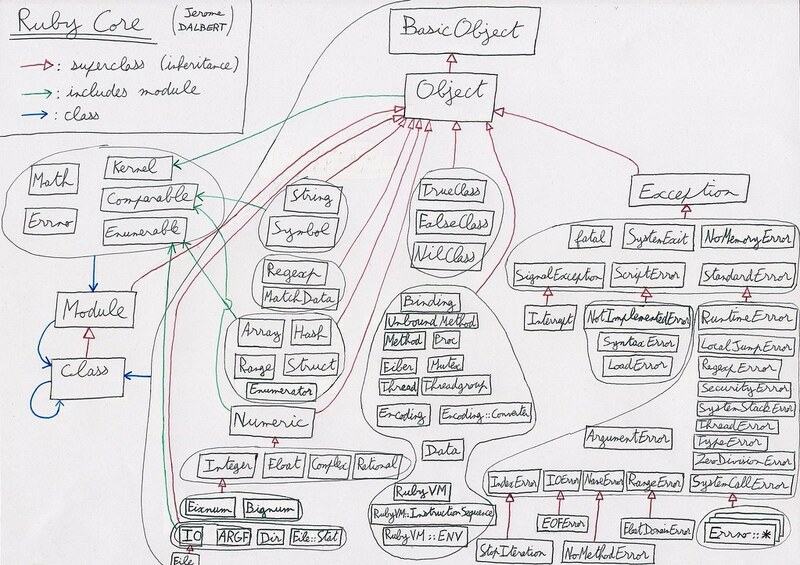 When I started learning Ruby, I could not find a decent diagram that would just sum up the Ruby classes, modules, and their hierarchy. Most of Ruby’s guts at one glance: pretty neat, huh ? Modules are on the top left. The usual types are here: strings, arrays, hashes, numbers, “booleans” (actually TrueClass and FalseClass). The error hierarchy is on the right. Other classes are in the middle. What can we “draw” from this ? Arrays are enumerable, numbers are comparable. 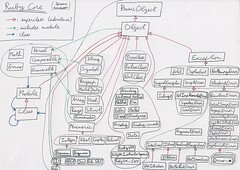 “Everything is an object”, or more precisely, every box is this diagram is a BasicObject. Object includes the Kernel module, so Object has all the instance methods of Kernel, like puts, gets, exit. When you write Ruby code, you are inside a main object, that’s why you can just write puts 'Hello world' instead of Kernel.puts 'Hello world'. So, everything makes sense and is quite simple actually! Except maybe the fact that a module is a class, and class inherits from module. Don’t worry, you will eventually wrap your head around it. In addition to Ruby Core, the Ruby Standard Library contains many other very useful classes and modules, such as Date, Forwardable, SimpleDelegator, Net::HTTP, OpenStruct, etc. This diagram does not explain the Ruby method lookup path, which takes eigenclasses, included modules and superclasses into account. I recommend reading this enlightening article from Practicing Ruby.